A low building with glass pyramids on top, the Safari Lodge is the area where guests visiting Jurassic Park would spend their nights. A swimming pool was outside, lined with a Jurassic fern called Serenna veriformans. Beige tones and rattan furniture with jungle-type motifs were in the room to be used by Dr. Alan Grant. Though the television was not functioning at the time, a channel listing was available so visitors could enjoy the dinosaurs from the comforts of their room. The rooms were in an unfinished state, and the room Grant was assigned to had pieces of electrical conduit all over the floor and stacks of lumber in the closet. Late security measures were put into the rooms, including bars over the windows, tempered glass in steel frames and steel-clad doors. As another addition, the entire lodge was surrounded by a twelve foot tall fence. Though gracefully landscaped and painted black to resemble wrought iron, the thickness of the metal still stood out. 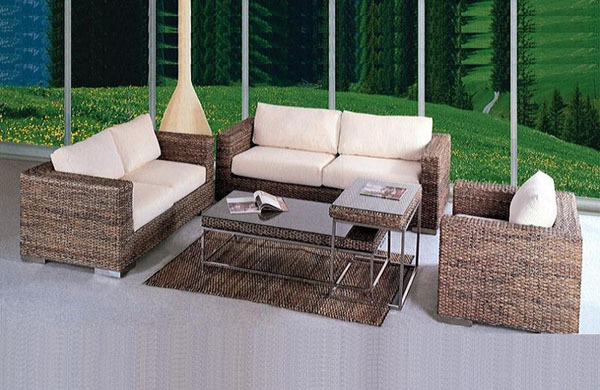 The image below is only a representation of the rattan furniture used. It is not to be taken that it is the exact style or color used in the novel.